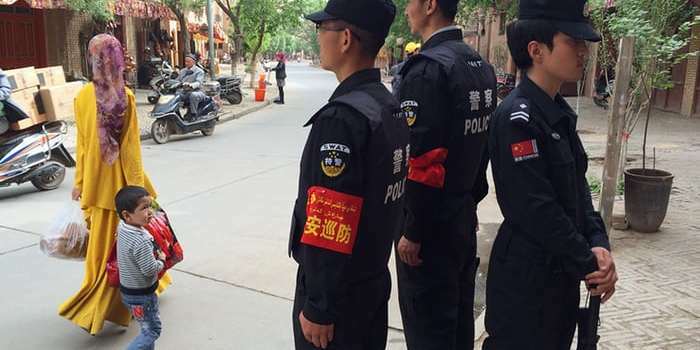 At least 120,000 members of China’s Muslim Uighur minority have been confined to political “re-education camps” redolent of the Mao era that are springing up across the country’s western borderlands, a report has claimed. Radio Free Asia (RFA), a US-backed news group whose journalists have produced some of the most detailed reporting on the heavily securitised region of Xinjiang, said it obtained the figure from a security official in Kashgar, a city in China’s far west that has been the focus of a major crackdown. Last year, as Xi Jinping was crowned China’s most powerful leader since Chairman Mao at a politically sensitive congress in Beijing, Xinjiang’s re-education centres were “inundated” by detainees, who were forced to endure cramped and squalid conditions, the report said. Just in the city of Kashgar – which has a population of about half a million inhabitants – tens of thousands of people were allegedly confined. Taking into account the wider region around Kashgar, the number allegedly rose to 120,000. Kashgar, the largest city in southern Xinjiang, has found itself at the eye of a growing security storm since a hardline party leader, Chen Quanguo, took charge of the region in the summer of 2016. Activists and academics say a key strand of an increasingly high-tech push to control Xinjiang’s residents has been the creation of “re-education centres”, where those suspected of going against the party’s teachings or being “politically unreliable” are being interned in their thousands. Last year BuzzFeed visited one such institution, known as the Kashgar Professional Skills Education and Training Centre, describing a beige building with shades covering its windows. “People disappear inside that place,” one local warned. One leading Xinjiang expert told Canada’s Globe and Mail the camps were “a form of enforced disappearances in a very organised way”. China defends what authorities call “extremism eradication” schools as an important part of its fight against radicals it blames for a wave of attacks. According to Human Rights Watch’s report, the centres are often housed in converted government buildings such as schools or specially built facilities. Wang said detainees were often held, unlawfully and without charge, as a result of religious “offences” such as excessive praying or non-religious acts such as accessing proscribed websites.